A drunk hit-and-run driver who hit two people on the road and left them to die, has found out that his victims were actually his wife and son. The man was shocked to discover that the woman and child he mowed down when drunk were his own wife and son. According to The Sun UK, the driver - named only as Mr Zhang - reportedly fled the scene of the accident after smashing into his wife's electric scooter at 10:30pm last night. 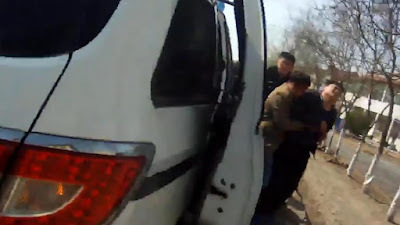 Horrified witnesses found the stricken pair on a darkened road in China's Shandong Province before calling an ambulance. According to local cops, the son was declared dead at the scene while his mum remains in intensive care. Mr Zhang was captured within hours of the horror smash and dragged to hospital to see his victims. Bodycam footage shows him wailing in anguish after learning what he had done. He told cops how all three of them had gone for dinner at a relative's house - but he drove off in a van while his wife took their son on a scooter. The pair were struck on the badly-lit street as they drove home. The man had allegedly been drinking before getting behind the wheel.